VHS tape had a long and mostly reliable run as the home recording device of choice. The three-hour tapes that were so long a part of the living room furniture are being replaced and phased out. There’s a new technology on the block and it’s fast becoming the new standard for recording television. Hard disk recorders are one of the main new technologies that have signalled the death of tape-based predecessors. Video and audio is recorded on to a disk that’s identical to the one found in a desktop PC. The advantages to this system mean that no recordings are lost because the magnetic tape gets mangled inside the machine. Not only that there’s no need to keep a library of tapes taking-up space on the shelf in the living room. The hard disk recorder works in much the same way as a VCR does. The signal is captured and turned in to a code that the recorder can then write to the disk in exactly the same way as data is written to any hard disk. This is then retrieved and played back when you want to watch it. Some hard disk recorders only have one tuner making it impossible to watch one channel and record another. If this is something you’re likely to want to make sure you get a model with two tuners. Also consider the amount of footage you’re going to want to store. The size of the hard disk will determine how many hours of video you can store. So the large the hard disk the more you get. It’s also important to note that the hard disk space isn’t infinite and unless you delete regularly you’ll quickly run out of space. There are some recorders that can be connected to a PC so you can archive off anything you really want to keep and even some with built-in DVD recorders that will let you make your own DVD videos. 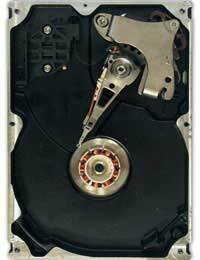 Hard disk recorders are about the same size as a DVD player and have a range of connections. TV signals are captured in exactly the same way that a standard VCR; through the aerial socket. Different models will vary with their output options however, most will have at least a SCART connection, some may include S-Video, composite and HDMI connectors for attaching to a high-definition television. The recorders all have their own operating system but they all follow a certain generic pattern. Rather than programming the recorder like a VCR most modern hard disk recorders will have access to an electronic programme guide. All you have to do is navigate the show you want to watch and select it. So there’s no need to input times or select channels, as this is all handled by the recorder. Some more advanced recorders will allow you to tag a particular series so that it always records the programme. If you don’t want to miss an episode of 24 or CSI then all you have to do is tell the recorder to always save them when they are broadcast. Hard disk recorders are one of the easiest and best quality methods of recording the television you most want to see. Buy the one with the largest hard disk you can afford and make sure to get one with two tuners for added flexibility and you’ll never miss that episode of your favourite soap, television drama or comedy show ever again.